While writing an article for the Delaware Bibliophile's newsletter,Endpapers, I received emails from other bibliophiles about their own projects. Communications began to fly back and forth once two of us realized we were writing about similar projects--the student produced books*. Meanwhile, another bibliophile began to email, thrilled with her own project and soon a bunch of book lovers were salivating over each others ideas, finds, and projects. This year, libraries, museums, theaters, and universities across the globe are marking the four-hundredth anniversary of William Shakespeare’s death by celebrating his life and works. 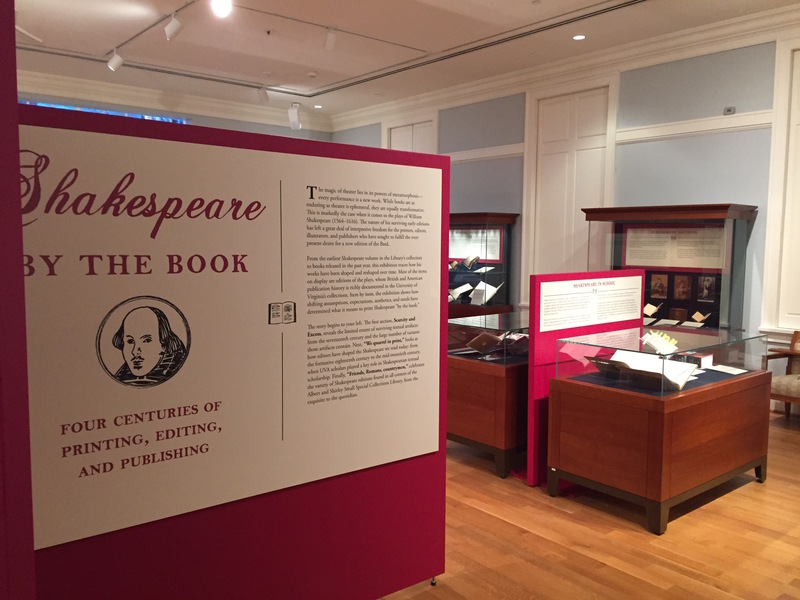 In our small corner of the world here at UVA, the Albert & Shirley Small Special Collections Library is making its own unique contribution to the festivities with the exhibition, Shakespeare by the Book: Four Centuries of Printing, Editing, and Publishing. This 160-year-old land transaction made on February 21, 1856 is rather straightforward. A piece of land in Lyman, York County, Maine was sold by Nathaniel Hill (1776-1857) to his daughter, Deborah Hill (1807-1863). Deborah, a single woman, purchased the land for $500.00. Philadelphia, Pennsylvania - February 2, 2016 -The United States Postal Service officially unveiled a new stamp honoring the celebrated African American leader Bishop Richard Allen (1760-1831). The stamp, the 39th in the "Black Heritage" series, uses an image from the Library Company of Philadelphia's African Americana Collection. The stamp's portrait of Allen is taken from an 1876 print entitled The Bishops of the AME Church. Crafted well after Allen's death, the print commemorated Allen's role as abolitionist, church leader, civil rights activist and writer. Donated to the Library Company in the 1990s by supporter Roger Stoddard, the print is one of many treasured objects in the Library Company's collection relating to Richard Allen. Ninety years ago today, Conrad Bowers was named a Boy Scout and "member of good standing." According to this Boy Scout booklet, he had qualified as a tenderfoot in March of 1925. As of January 30, 1926, he was a member of the Otter Patrol, Troop No. [illegible], of Marple Newtown, Pennsylvania. Bowers' record also provides some physical characteristics, giving his descendants a record of his juvenile height and weight. As a child, many an day was spent with Grizzly Adams, Ben, Nakoma and the lovable Mad Jack. Due to our transitory lifestyle, these characters, along with those found in books, served as surrogate companions until I overcame the "new kid" persona. What I did not know at the time, was that Grizzly Adams was based on an actual person. I had read, or so I thought, about all of the mountain men with Jim Bridger (1804-1881) being my favorite. It was a bit of a surprise upon learning that Haggerty's portrayal was based on a historical figure. John "Grizzly" Adams (circa 1813-1860) made his way west from Massachusetts in 1849. He was possibly lost after his father's suicide, leading to the decision to undertake the journey. Adams followed in the path of many others that went west after the gold rush in 1848 but, he shared only the westward direction with the others. Eddie Ellis (1873-1940) was born in Polk, Iowa and married Mary M. Murrow (1872-1958) on January 16, 1895, one hundred and twenty-one years ago today. Example of a printed fraktur with freehand decoration by Arnold Hoevelmann (1749-1804). Hoevelmann decorated it for Peter and Hannah Enders after the birth of their son Johannes, in 1767. 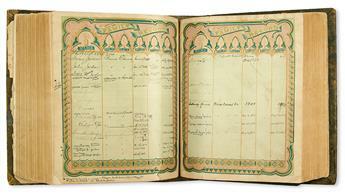 A two-page bible record gives limited information about Julian Henderson Thayer and his wife, Nancy Jane Reid. Portions have information written over what was originally there, so those parts are hard to read. For example, it is not clear if Anney Thayer's name was spelled Anney or Anny, and it is uncertain if she was born September 7 or 8. This record says Julian Henderson Thayer, son of James and Anney Thayer, was born July 7, 1842 and Nancy Jane Reid, a daughter to Richmond and Eliza Reid, was born September 7 or 8, 1849. Also, the record gives no clear location indicating where these two individuals were born. No children are listed as having been born to the Thayer's. Instead, this record jumps to deaths in the family. Julian Henderson Thayer died June 10, 1909 at the age of 66 years, 11 months, and 2 days. He was buried at Mount Pleasant Methodist Cemetery on June 11, 1909. Nancy Jane (Reid) Thayer died March 8, 1915 at the age of 65 years, 4 months, and 1 day. She, too, is buried At Mount Pleasant Methodist Cemetery. She was buried on March 9, 1915. An additional entry suggests the Thayer's had descendents, but it mentions no family relationship. This entry is for Charles H. Thayer, husband of Nell W. Thayer. Charles H. Thayer died February 28, 1958 at the age of 77 years (77 was written over 67), 8 months, and 28 days. He was buried in "Carolina Memorial Cemetery, Concord, NC." A New Year's Wish from Passed Time! While making my rounds at area flea markets, I came across a booth filled with books and stopped to look. I was delighted, but also surprised, to find many of the books were about printing. I immediately bought all materials related to that particular art. For her part, the vendor was both startled and thrilled at the realization the books were going home with someone who enjoys the history of printing. As we spoke, the vendor disclosed that the books belonged to her late husband, Edward "Ned" F. Heite (1939-2005). He was an archaeologist, historian, and proud Delaware native. As M. Heite was downsizing, she suggested I return later for more of his books. True to her word, she brought books, but M. Heite also gave me a gift--one which can never be repaid. During his lifetime, Ned printed ephemera which voiced his opinions and passions. M. gave some of this print-work to me, along with permissions to share them on Passed Time and specifically, In Their Own Words. To state "I am touched," is probably one of the biggest understatements of the year. Recently, we have been organizing to ensure we are ready for the New Year. As a quick aside, does anyone believe 2015 is over? It seems like it just began a couple of months ago, and I do not even remember having summer. In any event, I went back to the box which houses the Harrison Allen Krips and Esther Elizabeth Larzelerepapers, intent on putting them away. Most of the box contains twentieth century random magazine clippings, most incomplete or even just fragments. Nevertheless, these fantastic bookmarks and the Krips/Larzelere papers were tucked in between some of the clippings. Did the bookmarks belong to the Krips/Larzelere family? Just in case there is a link, I want to mention they were found in the same box. Today is a good day to run with an article about a rescue--even if it is a salvation of a different sort. The article, "Division Volunteer Saves World War II Photo Collection," details the near loss of a treasure trove of primary sources. Carolyn Apple, an emergency medicine physician, saved World War II-era photographs taken by Dover, Delaware native William D. Willis who had served as a military photographer in World War II. * As the account of the rescue of the photographs falls into the purview of my blog, In Their Own Words, I approached the author about the use of the article on PT. Jim Yurasek, the article's author and press contact and information lead for the Delaware Division of Historical and Cultural Affairs, immediately said "yes." After much consideration, however, we have decided that readers might enjoy the other articles and information found on the Delaware Division of Historical and Cultural Affairs website, and therefore have provided links for the reader. As always, the folks here at Passed Time would like to thank America's veterans. Pat Earnest, 2015. *Many of Willis' photographs are now on display in an exhibit titled World War II: Through the Lens of William D. Willis at Legislative Hall in Dover. Passed Time is fortunate enough to be able to share stories from three "living" history projects (the building of the Museum of the American Revolution, The Rich Mouse, and The St. John's Bible). We first reported on The Rich Mouse project back in September when the project was still looking for funding. (The Rich Mouse). In 1998, Saint John's Abbey and University commissioned renowned calligrapher Donald Jackson to produce a hand-written, hand-illuminated Bible. We invite you to explore this work of art that unites an ancient Benedictine tradition with the technology and vision of today, illuminating the Word of God for a new millennium. *Passed Time would like to thank Garth's Auctioneers and Appraisers for use of their image. Historical Society of Ocean Grove Says "Thank You"
This entry written for Alice was made by Virginia Ryan. At first, the only Virginia Ryan who surfaced during research was Virginia Ryan Offer (1922-2014). Although she would have been older than her classmates upon graduation, her dates worked and she lived in New York. Yet, I was not comfortable that this was the same Virginia Ryan and wanted to find tangible proof connecting her to Nanuet. Luckily, I decided to keep digging. An entry in the July 5, 1962 edition of the Orangetown Telegram of Pearl River, N.Y. disproved my original premise. * An article about the 20th reunion for the Pearl River High School class of 1942, the very class of which Alice, Virginia, and their fellow classmates were a part, provided new information. The reporter states one Virginia (Ryan) Boccard attended the reunion although she was absent from the photograph. The signatory in the autograph book and the adult Virginia can now be reconciled. From that point on, Virginia Ryan Boccard was easy to find on various genealogy sites.